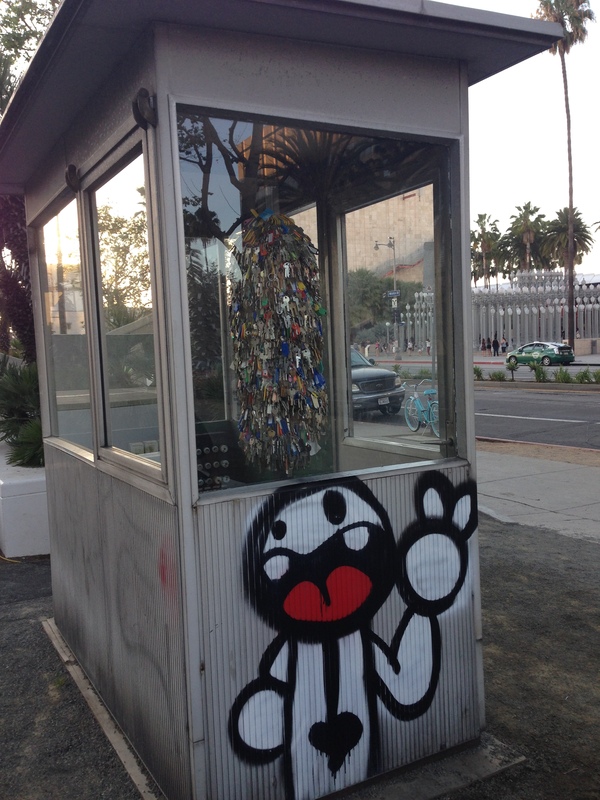 This post was written in September 2015 and then updated in late 2017 after the Wende Museum moved to its new location in Culver City. One of my favorite places to stop during a walk with Indy is The Wall Project across from the Los Angeles County Museum of Art. 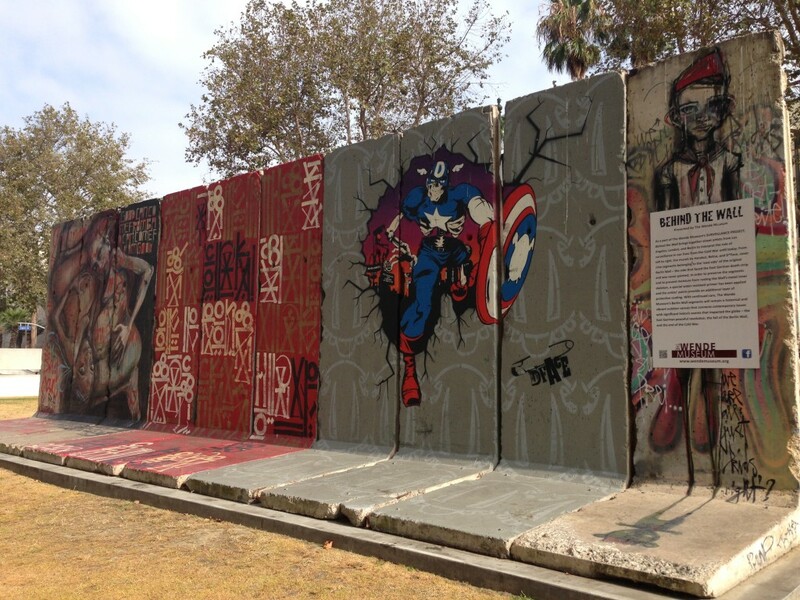 The Wall Project was created in 2009 to commemorate the 20th anniversary of the fall of the Berlin Wall. This ten-section segment of the wall is the longest outside of Germany. The last four sections of the front contain original art and the rest were painted during the installation. The back of the wall, which was in the GDR, was unpainted. It now contains the Behind the Wall exhibit featuring street art interpretations by Herakut, Retna, and D*Face of the role of surveillance in our lives from the Cold War to today. Next to the wall, there’s a former GDR Guard House filled with keys. The guardhouse formerly stood in the parking lot of the General German News Service. It became the foundation for a traveling and changing exhibit ADN Guardhouse. 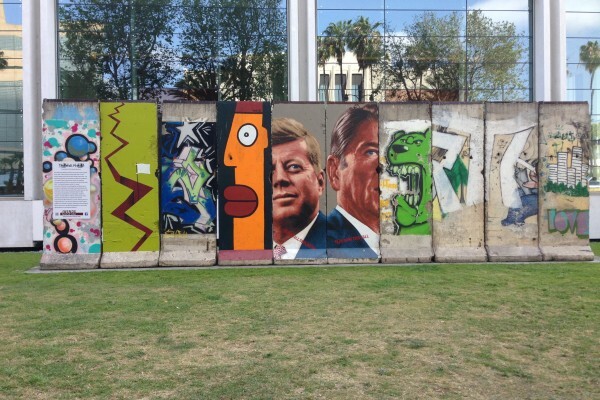 The Wall Project is part of the Wende Museum’s permanent collection. The ADN Guard House is on permanent loan and will be moved to the Wende Museum’s new sculpture garden. I hadn’t heard of the museum, so I checked out the website and then we planned a visit. 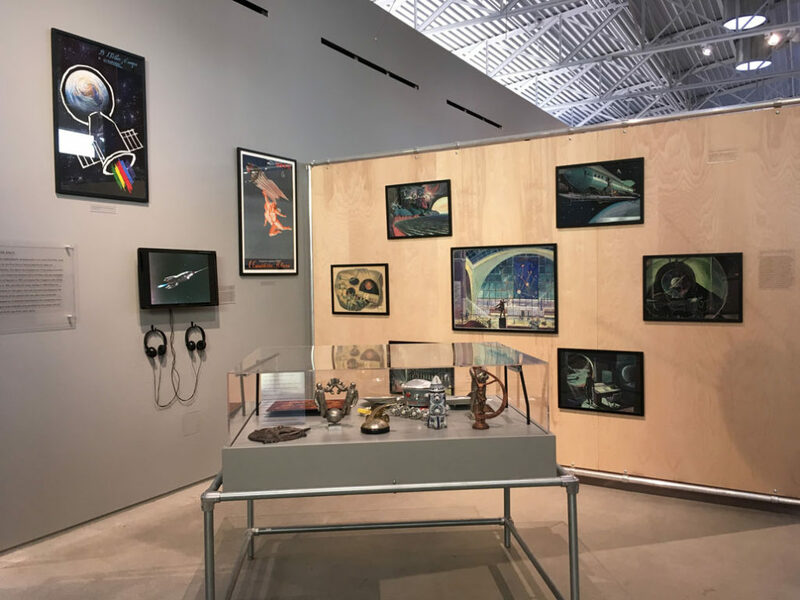 The mission of the Wende Museum is “to preserve Cold War history, inspire a broad understanding of the period, and explore its enduring legacy.” The museum is currently located in an office complex, but there are exciting plans to move to a former armory building. Outside the entrance, you are greeted by a section of the Berlin Wall with a colorful Thierry Noir painting. I was a bit unsure about the museum when we entered the main gallery. There were several small rooms displaying a wide variety of East European plates in different materials (the collection has 1,000+). They were cool, but I wondered if there was anything more to see. We hadn’t planned to go on the guided tour, but happened to arrive when it started. We followed the small group into a secured area and down a flight of stairs to the archives. Ah – that’s where they keep all the fun stuff! 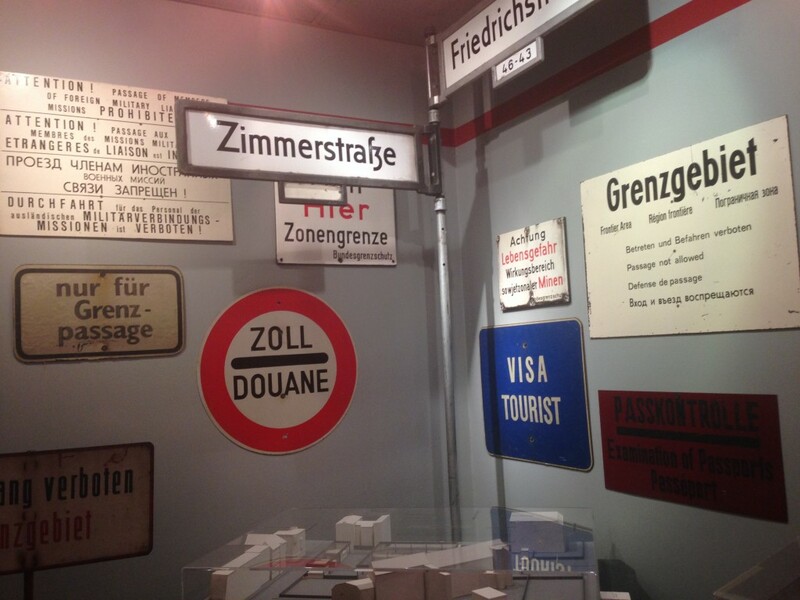 It felt less like viewing museum exhibits and more like exploring a relative’s basement. 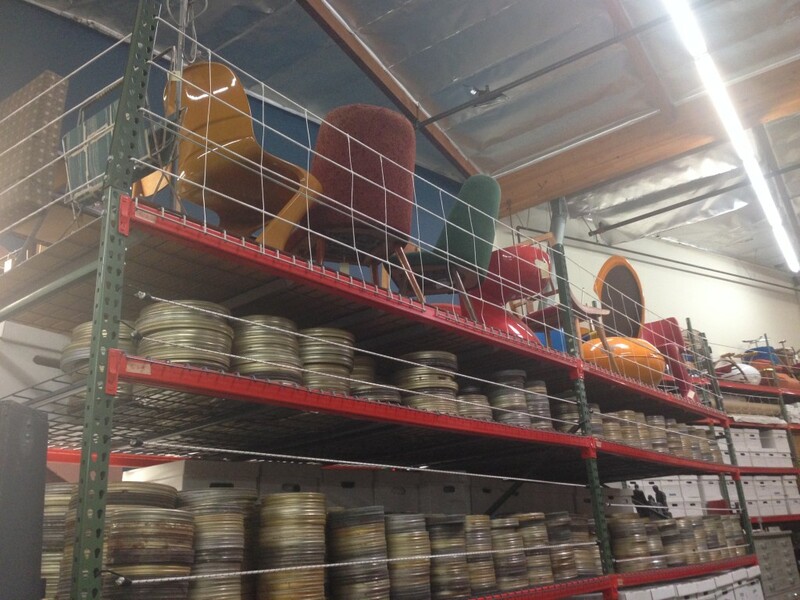 I felt a little sensory overload as we strolled through the archives. Narrow aisles overflowed with household items, furniture, clothing, books, electronics, posters, paintings, signs, flags, ceramics, and film canisters. And there was even more… Shelves were stacked with packages wrapped in brown paper just waiting to join the collections. 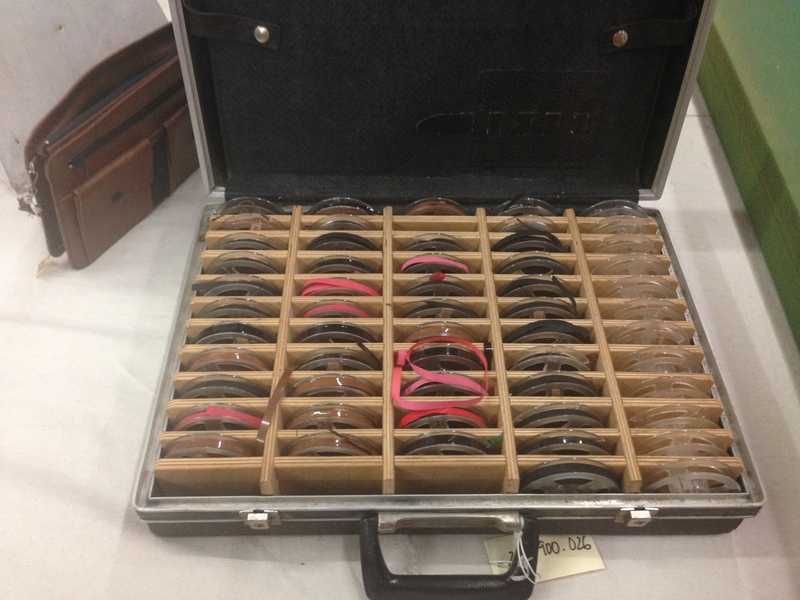 Tables near the staff work areas displayed espionage equipment like a Stasi briefcase. Unlike most museums, the objects were not displayed in glass cases or behind ropes. You could reach out and touch them – although I figured to0 much might be a no no. 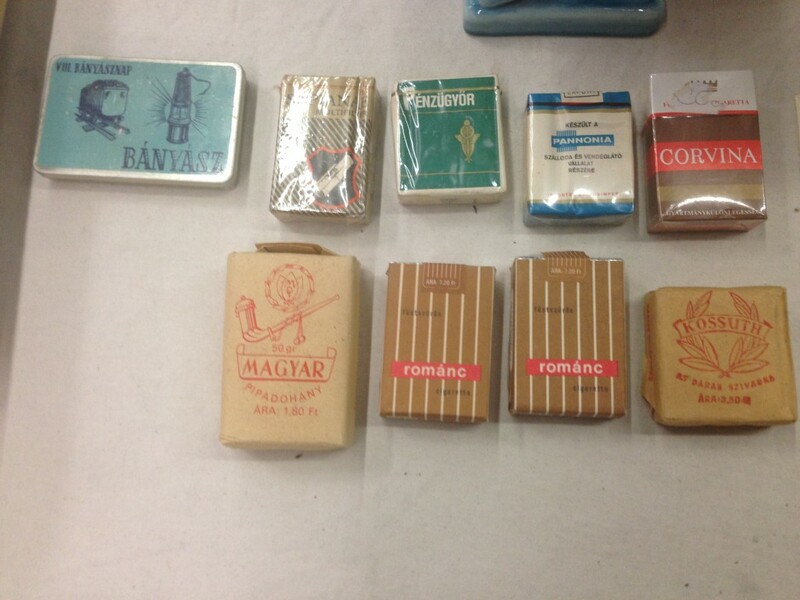 The tour concluded in the Peter Bochmann Border Guard Collection. Major Peter Bochmann was a guard at the east side of Checkpoint Charlie between 1964 – 1990. 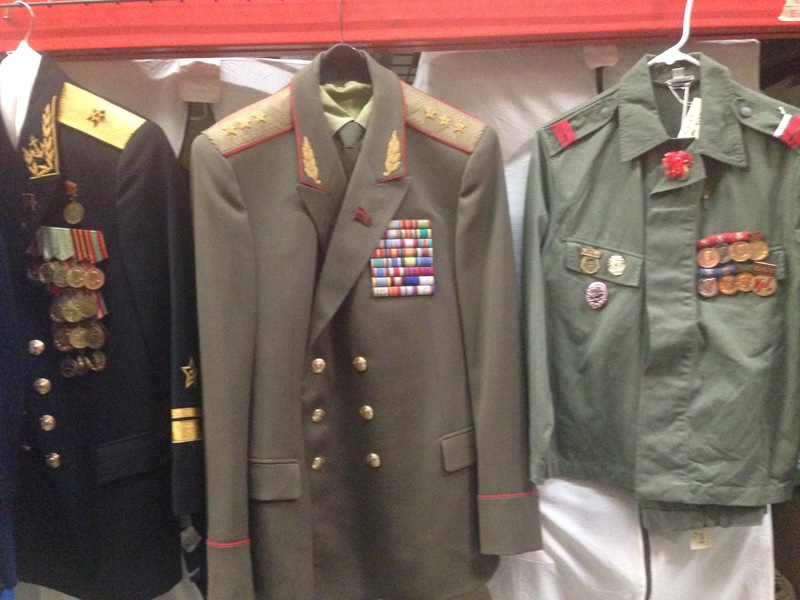 He collected an incredible array of equipment, photos, and documents from the guard station. 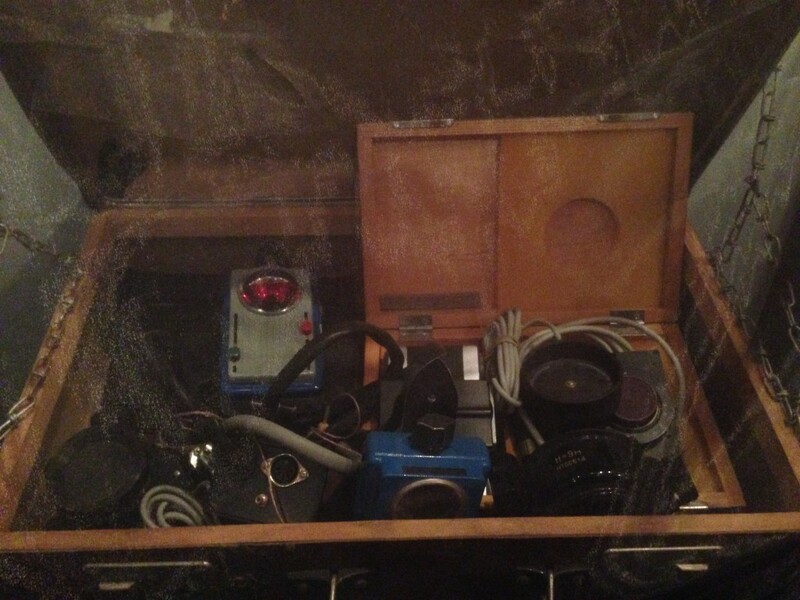 Some of the cooler items include passport stamps, surveillance equipment, and photos from a facial recognition system he was developing for the guards. I thought about our visit to Berlin and what it was like to see the former sites of Checkpoint Charlie and the Berlin Wall. During our short visit, we only got a teaser of the many interesting objects at the Wende Museum. I feel like they have so many more stories to tell. I can’t wait to visit the new location when it opens to discover more. A few months ago, I snapped a few photos of an old civil defense siren near the Miracle Mile. I intended to do some research to learn about it, and voila, I saw a link to Cold War LA on the Wende Museum website. 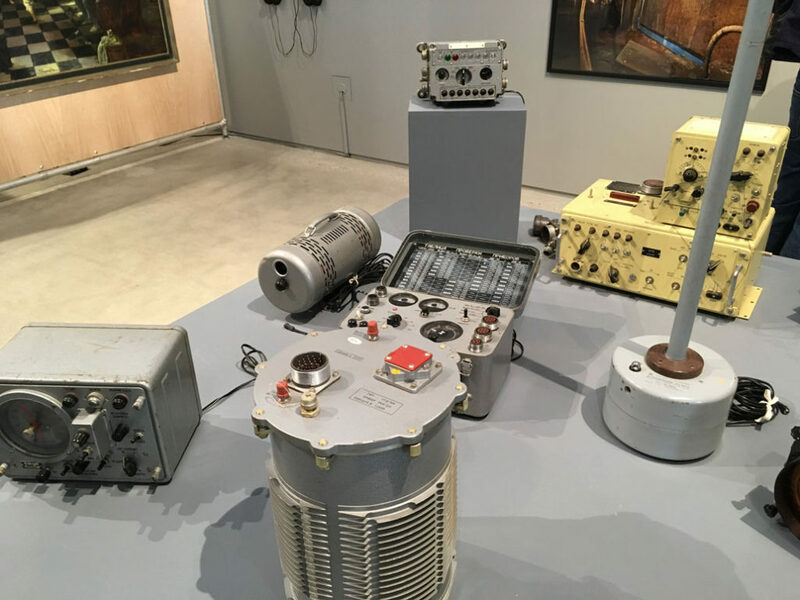 It is a Federal Model SD-10, created in the early 1950s as an air raid warning signal. During the Cold War, the sirens in LA were tested the last Friday of the month at 10:00 AM. The Wende Museum has limited visitor hours, so be sure to check the website before you visit. Parking is free at the onsite lot. In November 2017, the Wende Museum moved to its new location and held an open house celebration. 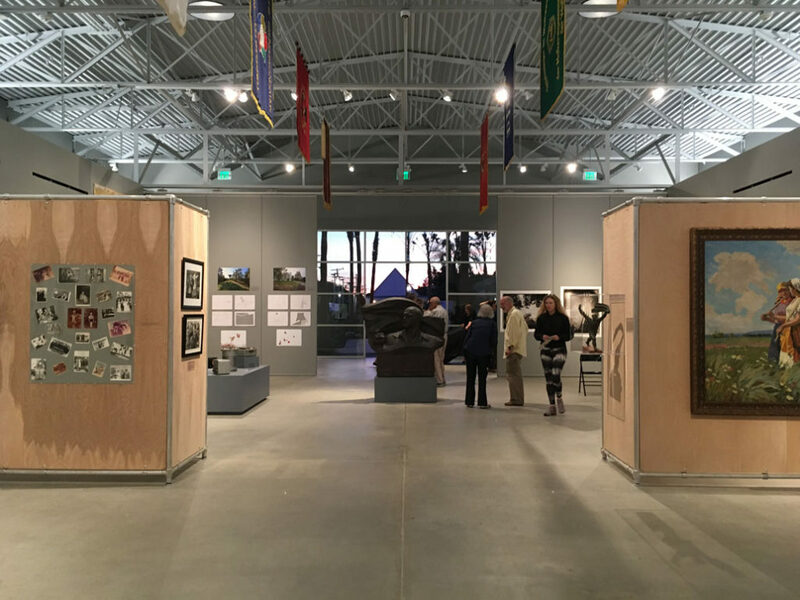 The former armory was transformed to an open space that displays many of the items from the previous location, along with photos and multimedia exhibits. There is also a lovely outdoor garden and tempting gift shop.